The original plan for the trip was to stop in Dubai on my way in between India and Tanzania. However, after doing some research on the round-the world ticket, I would have had to go through Thailand if I wanted to go to Dubai. It turned out that Ethiopian Airlines flies to both Mumbai and Kilimanjaro via Addis Ababa. 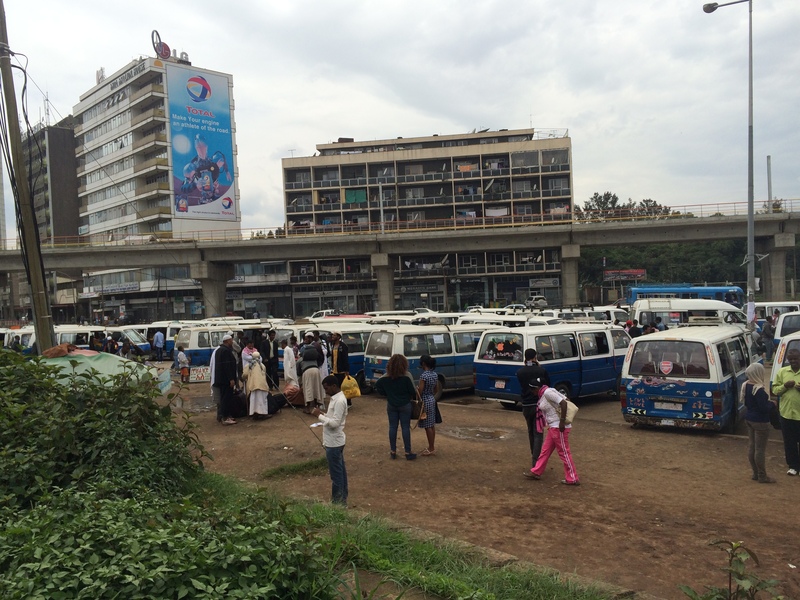 Since stopovers were free with the RTW ticket, I decided to spend 2 days in Addis. The flight left at 6:30 am so the plan was to stay in the hostel until about 1 then take the taxi to the airport. Unfortunately, the hostel had a midnight curfew so I had to leave early and pull the all-nighter in the airport. Checking in for the flight at 1:30am was one of best people watching displays in the world. There were Nigerian men in western business suits, traditionally dress Muslim families heading to Comoros, Indians in white dhotis and colorful saris, Zambian women wearing traditional head scarves, my favorite: a man from Togo wearing a hot pink sports coat, collar popped, with Oakley sunglasses and me the lone white person. Understandably, I got a few laughs and stares when walking into the line. After 5 hours of walking around, we finally got the board the plane which happened to be the brand-new Boeing 787 Dreamliner. The tint controlled windows, USB phone chargers and the indirect lighting were all very impressive. Most of the other passengers were confused as to why I was taking pictures of the plane, but nobody said anything to me. Another 5 hours later, we landed in green Ethiopia. After getting my visa on arrival and bags, I was greeted by a lady who ran the pre-paid taxi service. I walked over with her to the car only to learn that the taxi ride cost about 10x what I had researched it to be. However, seeing no other options as normal cabs are not allowed to go to the airport, I got in (the taxi cost me $22 for a 30 minute ride). Typical street in Addis near the district called Mexico. They are currently building a metro light rail but progress is slow. I then checked into my hotel and got breakfast before heading out into the city. I found out that tomorrow was going to be Eid Al-Fitr the end of Ramadan and everything would be closed. Although I was incredibly tired, I knew that this was my one day to sightsee. To get around, I used the public transportation system of minibuses, 12 passenger vans that drove along a fixed route. A teenage boy rode along calling out the destination and collecting payment. Each ride cost about 15-20 cents. From my hotel to get into the city, I had to walk to a place called Mexico then take the minibus. I struggled a lot to figure out the system because the minibuses did have the destination written on the front of the bus, but it is written in Amharic, a written script unique to Ethiopia. The minibuses did have designated stops, but they were simply unmarked parts of the street. Additionally, very few people spoke English here so it sometimes took up to 10 minutes of pantomiming to figure out where I needed to stand to catch the right minibus line. 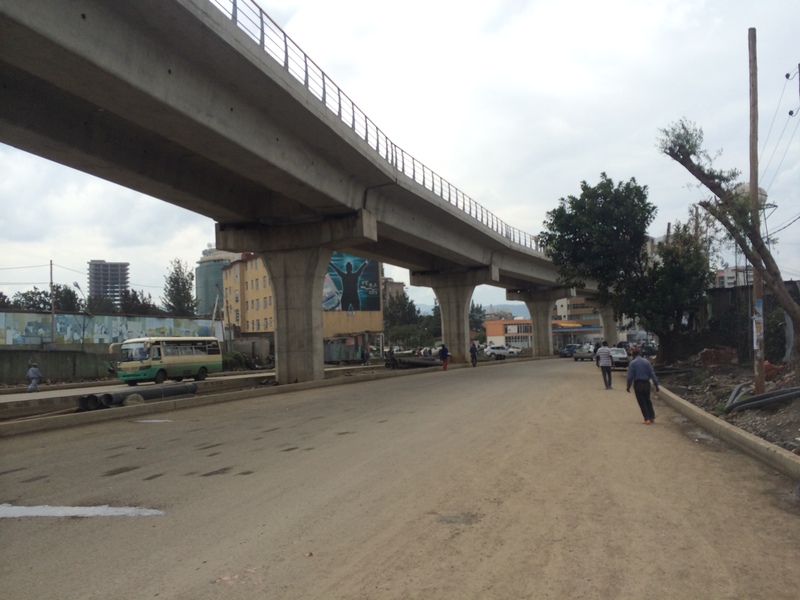 The streets of Addis (population 3.5 million) seemed fairly empty. Unlike India, Vietnam, and Nepal, drivers did not honk. The roads were actually in good shape here, although the sidewalks were not. On the sidewalks, there were dozens of boys and young men cleaning peoples shoes. This seemed silly given the dirtiness of the sidewalks and side streets, but having clean shoes was probably a status symbol of perceived wealth. Looking around, most of the Christian men had spotless white Converse shoes (Muslim men wore sandals). My first destination of the day was the National Museum. 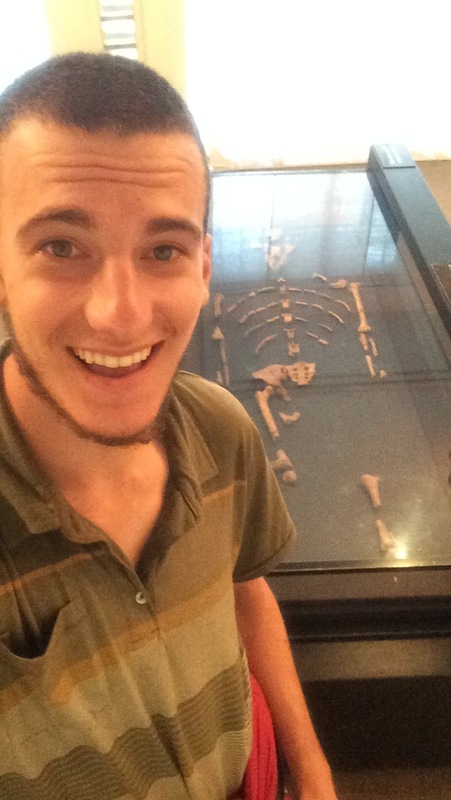 While the museum was small, it had some amazing treasures including Haile Selassie’s throne and the skeleton of Lucy, a 3.2 million year old hominid discovered in Ethiopia. 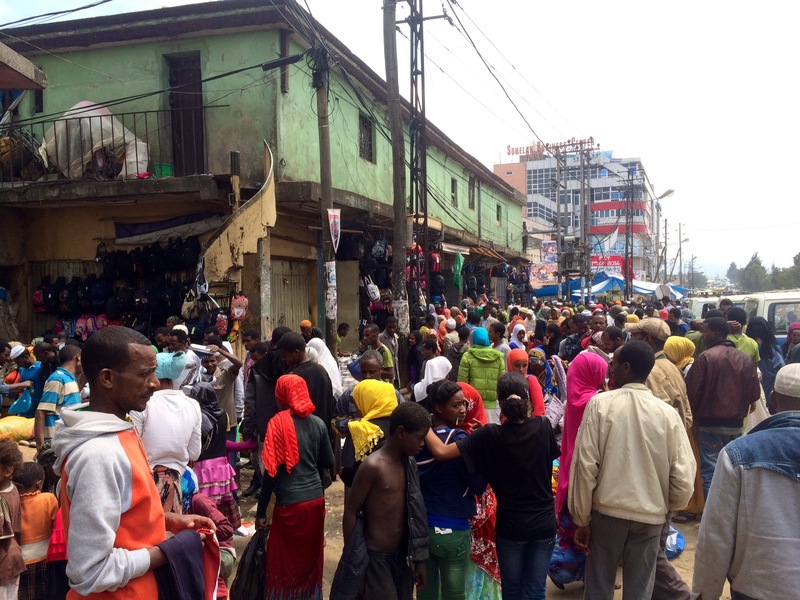 The second destination of the day was the Merkato, the world’s largest open air market. Built by the Italians during their 2 year occupation, it was over 5 square miles. The market consisted of thousands of merchants selling their goods along the street. Some streets were pedestrian only. The Merkato was packed with people- it was fun getting stuck in the sea of people. My favorite part of the Merkato was the clothing area because I finally figured out what happens to old clothing that people donate. Most of the t-shirts and sweatshirts were from US high schools and sports teams. I tried to buy a Kansas City Chiefs sweatshirt but the salesman refused to bargain with me. He was asking $10 for the sweatshirt and when I countered with $5 (standard bargaining is to halve the initial offer), he flat out refused and shooed me away. I really don’t understand why everyone quotes me absurd prices and refuses to bargain with me in clear bargaining situations. On the way back, the minibus dropped me off about 1/4 mile from the hotel. As I walked by a mosque, some men noticed my beard, grabbed my arm and walked me right by the red “Only Believers Allowed” sign and to the front of the large prayer hall. They offered me a Koran to read and I responded confused. They called over a man named Mussa Kadir to talk to me. He asked me if I was Muslim and I said no, explaining how I happened to end up in the prayer room. He the asked me my religion. When I responded with my usual “I don’t know” he smiled and said he wanted to teach me how to pray. I said yes. He talked about the history of Islam, it’s central tenants and what it means to be part of “the brotherhood”. After about 20 minutes, it was time to start the evening prayer and since it was the start of Eid Al-Fitr, there were about 1,000 people in the packed prayer hall. The imam started the song like chant of “Allah O Akbar” while people did the 6-step prayer calisthenics on their own. 5 minutes later, the chanting stopped and everyone shuffled into near rows shoulder to shoulder. We then slowly went through the prayer motion 3 times in unison changing positions on the “Allah O Akbar”. 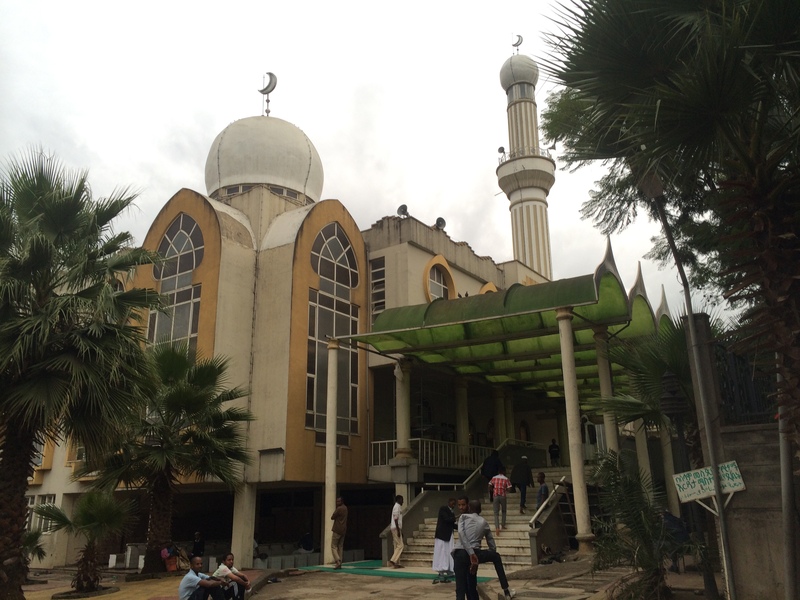 Afterwards, people walked around spraying perfume on people which I was told is how Muslims express joy in mosques. The energy in the room was electric. After the prayer, I walked back the hotel and went to bed exhausted and overwhelmed by all these new experiences. 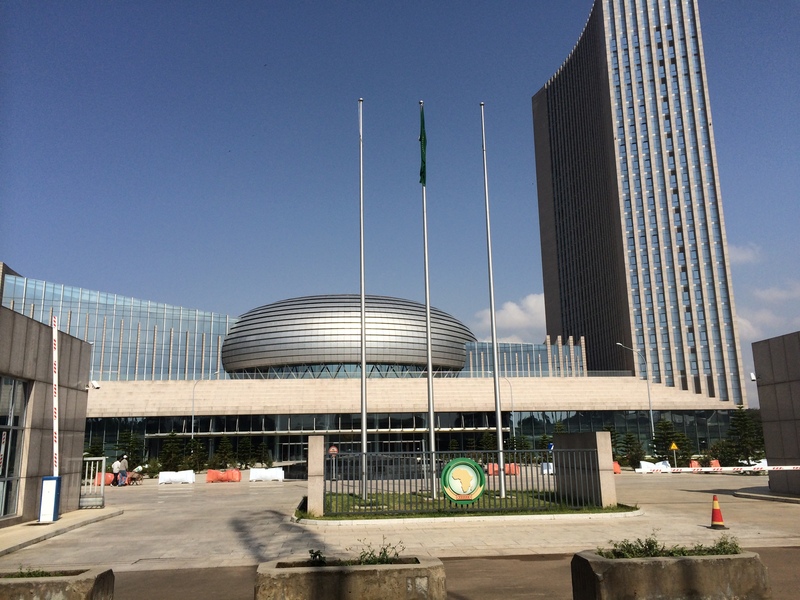 The next day after breakfast, I decided to walk over to the African Union 20 minutes away. Since it was a holiday, thousands of Muslims were walking down the street under the watch of dozens of armed police officers. Suddenly, I was approached by a Rastafarian man named Salamu who claimed to be a student. We walked and talked for about 2 hours before going to a busy coffee shop. There we got freshly made Ethiopian coffee and chewed a plant called khat. I later leaned that chewing khat is a legal 2,000 year old social tradition in Ethiopia that is practiced by an estimated 80% of the population. However, because it has a mild narcotic effect (less than cigarettes or alcohol), it was banned by most western countries including the US. When the bill came, it was about triple what I had expected it to be. Although I was clearly scammed, I wasn’t angry because being able to have the local experience in an untouristy setting was more than worth the $20 bill for 1 handful of khat, 2 cokes, peanuts, popcorn, 4 coffees, and a 2L bottle of water. So far traveling in Africa has much more difficult than in India or Southeast Asia. Luckily, Ethiopia was a safe country for Westerners given it’s colonial-free history. That said I was always extremely cautious of who I talked to or followed around and never got in a car or went alone into a building with anyone (I was approached by and turned away many more people than I discuss in this post). While I am looking forward to visiting more of Africa, I am certainly will miss the freedom to wander on my own. Ethiopia has such a unique history and culture that I definitely would visit again.